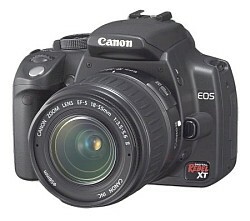 Canon EOS 350D Digital, which also known as Canon EOS Digital Rebel XT in North America and Canon EOS Kiss n Digital in Japan, is an 8.0-megapixel entry-level single-lens reflex (SLR) digital camera. Canon EOS 350D replaces Canon EOS 300D. Canon EOS 350D Digital (Canon EOS Digital Rebel XT) features 8.0 megapixels CMOS sensor, DIGIC II image processor, near instantaneous turn on and wake up times (0.2 seconds), Compact Flash type I and type II capability which supports microdrives, 14 frame continuous shooting buffer, interchangeable EF-S and EF lens, ASA/ISO range of 100, 200, 400, 800 and 1600, built-in pop-up with hotshoe with E-TTL II flash algorithm, mirror lock-up, selectable AF and metering modes, USB 2.0 interface, optical viewfinder and 1.8″ 115,000 pixels LCD monitor. For more features, specifications and sample images, visit Canon EOS 350D Digital official homepage (no longer available) or Canon EOS Digital Rebel XT official homepage. Fixes the phenomenon of shots being unable to be taken when using the remote controller RC-1. Fixes the phenomenon wherein the camera continues to scroll through images being played back.